"In this particular work, we used a technique called portable X-ray fluorescence spectroscopy (pXRF), in which a handheld instrument can be carried to a site and used right there, on the spot," says Karen Steelman, Ph.D., who led the study. "It gives you the elemental analysis of a specific material, and is the first step in figuring out how ancient artists used different materials to make their paintings." Steelman's research focuses on the analysis of rock and cave art, particularly in the Lower Pecos Canyonlands in Texas. 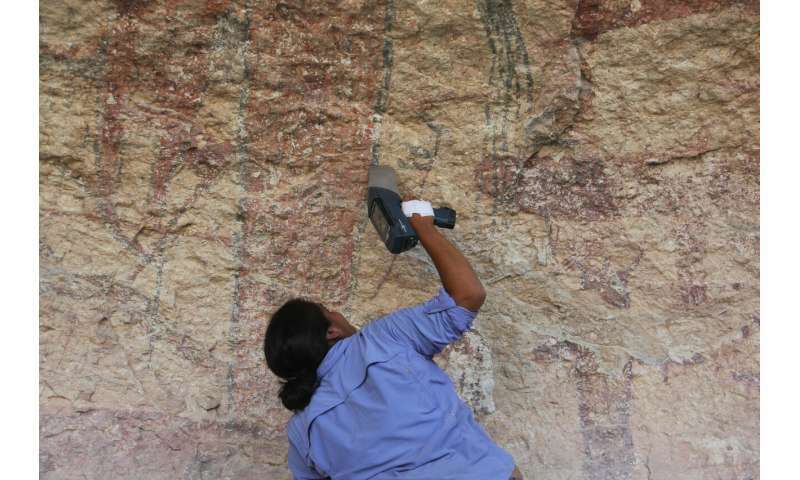 She and her colleagues at the Shumla Archaeological Research & Education Center have previously analyzed the composition of pigments at more than 10 sites in the region, but had been unable to see the bigger picture of how these pictographs were composed. Other pigment analysis methods, such as inductively coupled plasma mass spectrometry, require a sample of the rock art in question, which results in damage to the site, and field microscopes are unable to detect layers of paint in a complex mural. In addition to their findings on the composition of the pictographs, Steelman, along with fellow Shumla collaborators Victoria Roberts and Carolyn Boyd, Ph.D., discovered that the site appeared to contain gunshot damage. To confirm their suspicions, they again turned to pXRF to identify any trace elements that could have come from ammunition. "Unfortunately, we often see suspected bullet impacts at rock art sites," Steelman says. "Most of this is older types of vandalism from the early 1900s, and we used the portable X-ray to determine what trace elements were present." At the impact sites, pXRF revealed traces of lead, mercury and selenium, which were not present in the undamaged areas. There is a bright side to this discovery; finding damage at archaeologically significant sites is an opportunity to petition state and federal agencies for conservation funds to use for more extensive preservation measures, Steelman explains. With over 350 known rock art sites in the Lower Pecos Canyonlands alone, Steelman and team plan to continue using pXRF to see the full picture of the tapestry of color and symbol woven throughout the region. Flooding along the Rio Grande is a major threat to what the researchers describe as "the oldest books in North America," and they are on a mission to document and analyze as many sites as possible to preserve these stories for future generations. More information: Discovering hidden layers with X-ray vision: New applications of pXRF to rock art studies, the American Chemical Society (ACS) Spring 2019 National Meeting & Exposition.